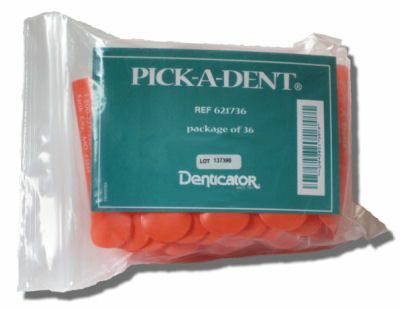 Pick-a-Dent, (Pickadent) made by Denticator, is one of the most durable reusable dental picks available. Won't bend, even after many multiple uses! Don't be fooled by imitations -- this is the genuine original product. Please note: this product is PICK-a-Dent and it does not have the rubber tip or the brush. If you are looking for TIP-a-Dent, which has the rubber tip and the brush, you can find that product HERE. If you have been searching locally for Pickadent, please note that the product is no longer available in local stores (and has not been for several years). But you can buy it here at DentaKit.com. Compare to the leading competitor and you'll see why Pick-a-Dent is the best -- our number one selling dental pick! Great for dislodging food from your braces before you brush, better than any other dentapick. Great for gum stimulation, too! Compact size: 3" long. This product is sold in factory-sealed packages of 36 (you get 36 individual Pick-a-Dents per package -- each with its own plastic orange holder). We are sorry, but we cannot sell Pick-a-Dents in packages smaller than 36 because that is the smallest size that the manufacturer makes. Want to buy Pick-a-Dents in larger bulk quantity? Click here to order a sealed bulk package of 144 total Pick-a-Dents. Pick-a-Dent (and other Denticator products) are no longer sold in local stores, but you can get them here at DentaKit.com. There are 36 Pick-a-Dents per package. Each comes with its own orange plastic sheath. Sorry, we do not sell this product in quantities smaller than a package of 36. The manufacturer makes it only in packages of 36 or 144. Personalized imprinting on the plastic sheath of this product is not possible. Denticator products have been around for many years, and Pick-a-Dent is considered the best dental pick on the market. There are imitators, but their quality and durability do not compare to the Pick-a-Dent. This product has a long and loyal following for good reason. It's one of our best-sellers! Where can I buy a smaller quantity of picks? Unfortunately, the smallest amount of Pick-a-Dents that we carry is a package of 36. They do not come in a smaller quantity. I started using these in 1974 when I had braces on my teeth, they were recommended by my orthodontist. I still carry them around with me and use them several times a day. My dentist says they do an excellent job of cleaning between my teeth and helping with Plaque! I was so happy to find these picks. I had been looking in stores for ages with no luck. These are the best--sharp to get between teeth where food gets trapped. And each one has a little case so you can take them with you and they stay clean. Definitely recommend this product. I am addicted to these picks. I keep them in my handbag, pockets and at reach in my home. Some spaces between my teeth allow food particles to remain after eating. The picks you can buy in the drugstore don't do the job like Pick-a-Dent. I always have one in my pocket. Always. So happy that you carry these! This is the only place I've been able to find Pickadents! I used to get them from my dentist. So happy that you carry them! I was introduced by these by an Orthodontist a long time ago. I was using them to clean braces. Now they are for my teeth. I am so glad to be able to order them through your company. I can't find them anywhere else. It easier to use than dental floss. The blade is excellent for keeping plaque from building up on your teeth. The tip is also excellent to stimulate the gum. Your dental picks are very durable and tough. They will probably last a lifetime, but they aren't designed to work well as a pick. They are too short, so the taper does not allow the pick to slide between the teeth very far. A longer, thinner pick will allow you to remove food from the outside of the tooth first, then push food between the teeth through to the other side. That has the effect of cleaning both sides of the teeth. It's more difficult to use a pick on the inside, between the teeth so a thinner, longer pick makes it possible to clean both sides by pushing the pick in from the outside only. Also, a more pliable plastic would make it easier to reach teeth further back in the mouth. It would also break sooner but then you get to sell more picks, right? I don't normally review things but I'm writing this in hopes that you might get it right. I have 4 picks left of a version I used to buy several years ago (don't know the name or manufacturer) and I've been trying for years to find a replacement. Merchant Response:Thank you for your extensive review of this product. We will pass your comments along to the Denticator Company, which is the manufacturer. (We do not make this product, we merely sell it). ProsVery tough and durable. In a hundred years these picks will look the same as they did when they were new. ConsThey are too short and the taper doesn't allow them to go all the way between the teeth. I wish I could find these in the stores but apparently the manufacturer doesn't do that anymore. I like the product. I just want to find it locally. Merchant Response:Thanks for your review, Dan. Unfortunately, the company that makes Pick-a-Dent doesn't sell it in local brick-and-mortar stores. It is only available online. These are one of the best products ever made! I have one in my car and one in my purse. When I'm home, I can floss. When I'm on the go, these are invaluable. They are long-lasting and less bulky than a toothpick, which wears and splinters too. They come in a nice protective pouch. My husband loves these. They last forever and have a nice pouch to carry it in. I have spaces between some of my teeth and this product does things nothing else does. It works differently than a regular toothpick or floss and makes cleaning my mouth much easier. My hygenist says I have the best mouth to clean because of this pick and yet she doesn't hand them out. What? !